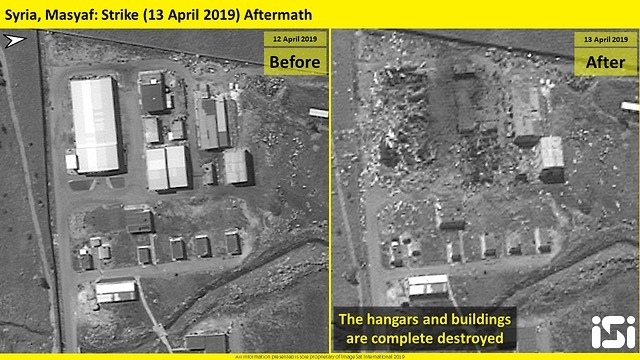 Jerusalem - Satellite images released by the Israeli intelligence firm ImageSat International (ISI) on Sunday showed the complete destruction of a possible Iranian surface-to-surface missile factory in Syria’s Masyaf District, allegedly struck by Israel on Saturday. The possible surface-to-surface missile factory included a main hangar measuring 60 meters by 25 meters, and several big industrial hangars and buildings which probably serve for production and assembly of missiles. “However, there is probably no manufacture or assembly of missile engines and warheads in this factory, since protected structures weren’t detected. Also no missiles or launchers were identified within the compound,” ISI said. Israeli officials have repeatedly voiced concerns over Iran’s entrenchment in Syria and the smuggling of sophisticated weaponry to Hezbollah from Tehran to Lebanon via Syria, stressing that both are red lines for the Jewish State. While SANA said the interception of the Israeli missiles resulted in the destruction of several buildings and the wounding of three “fighters,” according to a report by the London-based Syrian Observatory for Human Rights (SOHR), Iranian “elements” and pro-Iranian militants were killed and another 17 were injured. In January, Russia deployed its S-300 air defense system to Masyaf. Russia delivered the launcher, radar and command and control vehicle of the advanced air-to-surface missile system to the regime of Syrian President Bashar Assad in early October as a response to the downing of a Russian reconnaissance plane by Syrian air defenses during an Israeli airstrike on Iranian targets the previous month. The S-300 was not used during the alleged Israeli strike.